I have to admit, I had a bit of a shock at the Virginia Aquarium. 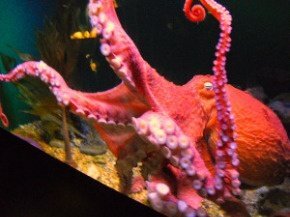 I went to the aquarium (formerly called Virginia Marine Science Center) expecting to get in for free, using my ASTC Passport Program membership (which gives you free admission to participating science museums around the nation). 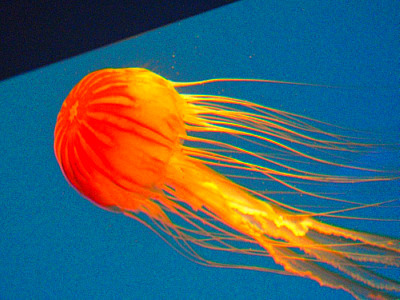 But I soon realized that, for what it offers, Virginia Aquarium is well worth the price if you like top-notch aquariums. At $22 for adults, it's about 35% less than the price of the Baltimore Aquarium, and about 50% less than Georgia's. So does The VA hold its own with other fishy museums? Absolutely. Virginia Aquarium's Floor-to-Ceiling Fish "Wall"
You should see the size of the sharks at Virginia Aquarium! My favorite part? Their mesmerizing, two-story, floor to ceiling fish “wall.” The rest of the room and floor is dark. Sit there quietly, and you can imagine you're at the bottom of the sea. It's amazingly relaxing to watch the fish swim gently by, and feel your cares wash away. Look at this photo by angelawrightphotography.com. (It's way better than any of my pictures of the tank!) Angela, the photographer, visited with her then 16-month-old son. She says he "was in awe of the sea turtle exhibit. He had no idea what he was looking at but he liked knocking on the glass (he can't read the no knocking signs and his mother was busy taking pics) and they seemed to give him more attention. He cried when I carried him off." My kids also loved the touch tanks (if you're a touch tank type, you might want to check out Virginia Living Museum and Norfolk's Nauticus as well). You'll find enough to keep you (and the kids) occupied for hours. And on a hot day, it's blissfully air-conditioned. For an extra charge, you can enjoy the new Adventure Park at Virginia Aquarium which they bill as "an eco-friendly zip line and aerial adventure experience in the trees above the scenic Owls Creek." Wooden platforms have been built at different heights in the trees, which you can reach by zip lines or bridges that form an aerial trail. The Park is designed for those ages 5 through adult. Of course, there is an additional charge for the Park. Look below for details. Whale Watching – (End of December through March) – Narrated by a specially-trained VA educator, these excursions let you search for humpback and fin whales off the coast of Virginia Beach. Cost: $30 and up per adult, $25 and up ages 1-11. Click here for special Whale Watching Package Deals! Creek Cruise – (April – Sept.) Embark on a 50-passenger pontoon boat for a 35-minute cruise of nearby Owl’s Creek Salt Marsh, the last undeveloped salt marsh in Virginia Beach. Cost: $8. Dolphin Cruises - (May-Oct.) These 90-minute excursions let you see bottlenose dolphins in their natural habitats, plus learn about VA’s dolphin research. Cost: $22 per adult, $15 per child. Seal Splash – (all year) This is the only program in the U.S. where you can actually interact with harbor seals. Cost: $180 per person. Ocean Collections – On this 90-minute boat tour of the ocean, staff will bring up samples of sea life for you to see, learn about, and maybe touch. Cost: $20 per adult, $15 (ages 1-11). Virginia Aquarium has “a la carte” pricing. National Geographic 3D Theater Only: Adults: $5-$9*; Seniors: $8.50; Children (3-11): $5-$8 *Feature length movie tickets are generally the higher amount. Military Discount: Active military and immediate family members, as well as retired military with a valid ID, get $2 off. Homeschool Day: Generally the last Friday in January, this special event for homeschoolers features 50% off admission plus special programs. Group discounts are available for groups of 15 or more by calling (757) 385-0300. Hours: Daily – 9 am to 6 pm (they tend to close at 5 pm during winter). Closed Thanksgiving and Christmas Day. For more information, go to virginiaaquarium.com. 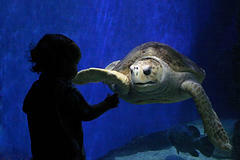 Want to get in Virginia Aquarium for less? During the spring and summer, Vacation Market often has a Virginia Aquarium “Happy Hour” coupon on the bottom of its brochures. The coupon allows you to buy one ticket and get the second one at 50% off if purchased between Noon and 2 pm (good daily). Or, check out the Visitor guides— like the “Sunny Day Guide.” You'll find them at restaurants, hotels, and in stands along Atlantic Boulevard and Virginia Beach. They often have coupons good for $2 off admission. Want to save on other museums? As I mentioned above, the Virginia Aquarium may NOT be a member of the ASTC Passport Program, but nearly 250 science centers and museums ARE...and that means you can save lots of money if you take advantage of this amazing deal. See what I mean by going to my ASTC Passport Program page.